Next time you want to see a show, go outside and look at the sky. The clouds will put on a show for you with their ever-changing shapes and sizes. This book reveals some fascinating science behind these beautiful displays. Author Emily Morgan answers all kinds of questions: What are clouds made of? Why are some clouds white? Which clouds mean fair weather is coming, and which ones mean rain is on the way? If you could reach those fluffy, floaty puffs, could you jump on them like a trampoline? 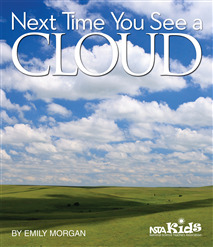 Next Time You See a Cloud is an engaging look at the science behind a sky-high spectacle. Make it a habit to keep looking up—there’s a new show every day! Awaken a sense of wonder in a child with the Next Time You See series from NSTA Kids. The books will inspire elementary-age children to experience the enchantment of everyday phenomena such as spiderwebs, sunsets, fireflies, the Moon, and more. Free supplementary activities are available on the NSTA website.